Trailer Park: The Woman In Black! Anyone can tell you if a trailer "looks good" or not. But Drew Magary, who spent over a decade working in advertising, is here to tell you whether or not a trailer WORKS. This week's trailer? "The Woman In Black". Does the trailer let us know what the movie's about? Oh, yes. 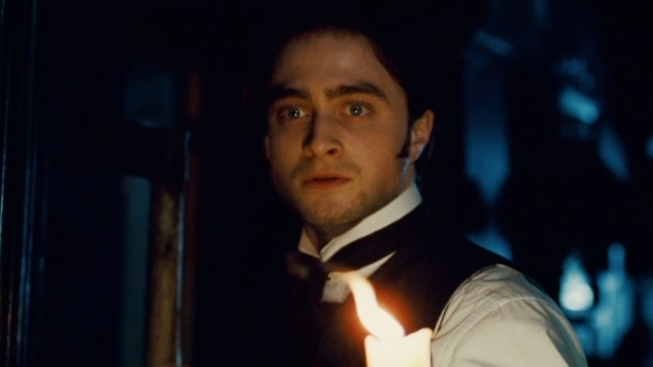 Daniel Radcliffe is an olde tymey English fellow who, for some reason, decides to hang out at the "old Marsh house," despite some lady telling him in no uncertain terms PLEASE DON'T GO TO THE OLD MARSH HOUSE. But Daniel is like STEP OFF, LADY! I'm not Harry Potter anymore! I'm a MAN, and that means I'm totally ready to hang out in a haunted house for six days for no good reason. Is Daniel wearing glasses? NO! He looks so grown up now. He doesn't even look short in this movie, which is crazy because Dan Radcliffe is three feet tall. Seriously though, why does he go to the old Marsh house? He's simply following the old Eddie Murphy rule of white people refusing to leave their house when there's a ghost in the house. Is the trailer scary? It is! There are all kinds of ghosty things going on. Rocking chairs that rock on their own. Little girls standing by graves in the rain. Photos of people who died long ago, with their eyes whited out. Ghosts looking out of windows. Doors that open by themselves. Ghouls appearing quickly in your reflection. EVIL MONKEY STATUES. It's all here, people. Are we sufficiently warned as to the scariness of this film? Yes. "A doorway has been opened." I assume that doorway was holding back, like, ghosts and stuff. Does this trailer work? Yes, but just barely. February is always a horrible time for movies, so I think audiences will cotton to the idea of competently made ghost story with an appealing actor at its center. Is there anything new here that you haven't seen a zillion times before in movies like "The Others"? It sure doesn't look like it. But when it comes to ghost stories, sometimes people don't want anything new. I also admire this trailer because it makes it clear that Radcliffe will be entirely on his own in this movie. He's going to be left alone and exposed, both to those pesky ghosts and to the audience, and that kind of risk-taking could make this a worthy endeavor.